1. Melt 50g of the butter and mix with the muscovado sugar. Stir in the apple and blueberries. Beat the remaining butter and sugar together until pale and light. Beat in the lemon zest and the beaten eggs a little at a time. Sift in the flour and fold into the creamed ingredients with the lemon juice to give a soft consistency. 2. 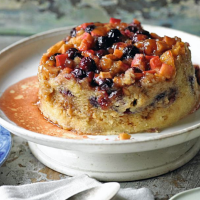 Spoon half the fruit mixture into the base of a buttered 1.2–litre pudding basin. Top with half the creamed mixture then repeat. Cover with greaseproof paper and foil tied tightly with string, then steam for 1½ hours. Turn out onto a warmed plate and serve with crème fraîche or pouring cream. Cook's tip Use up any leftover blueberries in a smoothie. Use up any leftover blueberries in a smoothie. Serve Campbells Rutherglen Muscat, Rutherglen, Australia, £9.99/37.5cl. Rutherglen Muscat is a legendary Aussie 'stickie' (sweet wine) made from different aged barrels of late-picked Muscat a Petit Grains in Victoria.